Born 1933, and lives in Isonville, Kentucky. 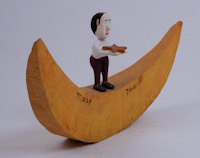 Wilma Stephens was first introduced to us by her cousin and fellow folk art carver, Minnie Adkins. One day we drove to visit and Minnie said, "Come on, I want you to meet my cousin Wilma." We drove to Wilma's house in town. 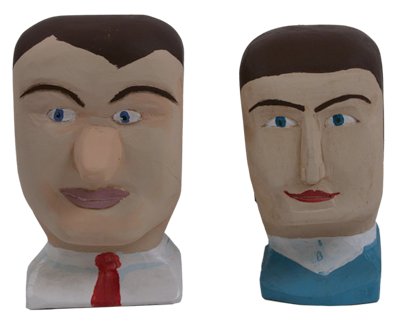 She sold us the carved heads of a male and female and chatted before taking Minnie back to Peaceful Valley. We had already heard about Wilma Stephens while purchasing a piece of her earlier work at the 1993 Elliot County Sorghum Fest. A group of about a dozen artists from Elliot and neighboring counties including Denzil Goodpaster and Garland and Minnie Adkins were displaying and selling their work. We purchased a piece of Minnie's work titled "Minnie's Mouse" a tall mouse on skinny knob kneed legs. We were also interested in the piece titled "Moon Time." It looked like a wedge from a Crenshaw melon or yellow squash. It was obviously intended to be a crescent moon it's name suggested. Perched on the moon was a small male figure presenting a star. We assumed it was another one of Minnie's "one of a kind" pieces. 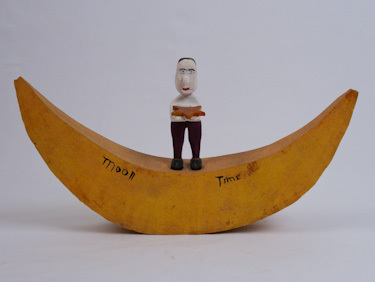 The figure usually representing Garland in that era of her work looked just like the one on "Moon Time." Minnie noticed our interest. She said "no, it's Wilma Stephens. I helped" but it was "her signed work." We have always appreciated the work for what it is and isn't, and what it represents Minnie's ethos of mentorship and community.